Explanation: The classic appearance of the popular Ring Nebula (aka M57) is understood to be due to perspective - our view from planet Earth looks down the center of a roughly barrel-shaped cloud of gas. But graceful looping structures are seen to extend even beyond the Ring Nebula's familiar central regions in this false-color infrared image from the Spitzer Space Telescope. Of course in this well-studied example of a planetary nebula, the glowing material does not come from planets. Instead, the gaseous shroud represents outer layers expelled from a dying, sun-like star. By chance, spiral galaxy IC 1296 is also visible in the upper right of this Spitzer view toward the constellation Lyra. 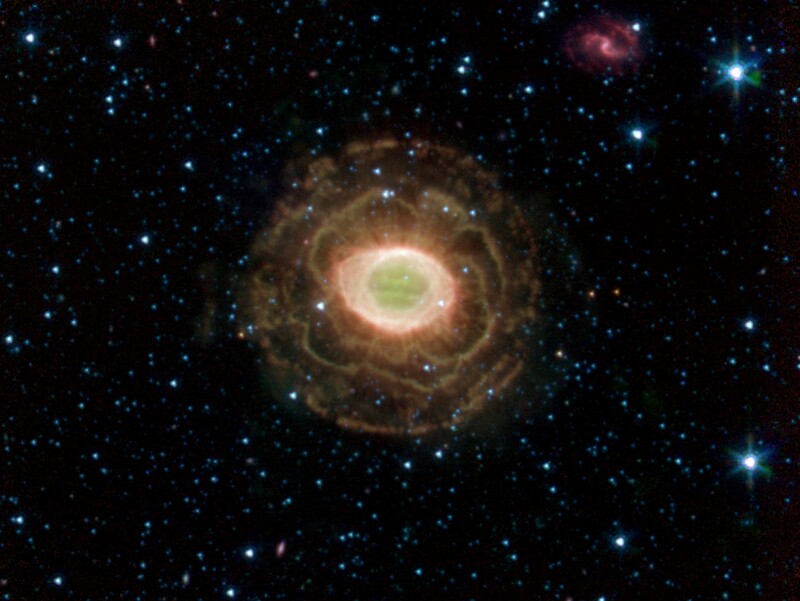 The central ring of the Ring Nebula is about one light-year across and 2,000 light-years away. However, galaxy IC 1296 much bigger and hence farther away ... about 200 million light-years distant.